Since I don't smoke, I decided to grow a mustache, it is better for the health. However, I always carried a jewel-studded cigarette case in which, instead of tobacco, were carefully placed several mustaches, Adolphe Menjou style. I offered them politely to my friends: 'Mustache? Mustache? Mustache?' Nobody dared to touch them. This was my test regarding the sacred aspect of mustaches. 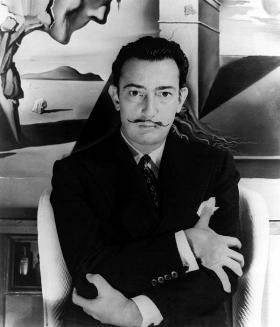 Below are more quotes by Salvador Dali. It's better to have loved and lost than do forty pounds of laundry a week. An elegant woman is a woman who despises you and has no hair under her arms.